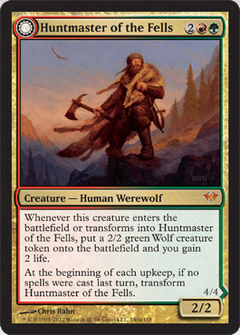 Time to stock up on Huntmaster of the Fells! Kelly Reid and the folks at QuietSpeculation.com just posted a fresh take on Ramp from ChannelFireball. Primeval Titan already made our “top 5 biggest changes” list today and this deck contains four of them. If this deck does well, expect titans, and huntmasters to continue to go up in price (check out the volume graphs on Huntmaster – note that ChannelFireball had ZERO in stock at the time of the last scan). Previous PostGuest post on Dark Ascension pricing on MTG Realm!Next PostChange is afoot!